"... I have made you a sign for the house of Israel..."
This morning's first reading at Mass was a bit... dark. The prophet Ezekiel was inspired to literally embody the exile that unfaithful Israel was about to become. He "shouldered the burden" and dug a hole in the wall of the city and escaped in the darkness of night to show the people where their sin was leading them. A sign in his very body of what was to come. God loves teaching us this way, through physical signs and symbols. A few millennia away from Ezekiel's experience, sitting in the church pew, close to my wife, with a hand on our little boy's soft head of hair, I had a whole other train of thought start chugging down the tracks of my mind. "I have made you a sign..."
The summer has allowed me to go, most days, to daily Mass with my family. I'd heard it from Rebecca but now I see how others love to watch our little boy - quite literally the "MASScot" of St. Charles parish. Playing with his books, begging for goldfish, and pointing to Father at the altar (affectionately referred to as "ZAH! "), he brings loads of smiles to the retirees, young couples, and rosary ladies (glue of the Church, seriously) who attend Mass with us. "I have made you a sign." It's easy to see that little squirt as a sign of God's love in the world. Any child still dripping with the waters of Baptism seems still in communion with the angels, don't they? But then I thought of Rebecca this morning, and myself, and our son. And the thoughts got bigger. We must all become like little children.... magnets of joy, wonder, trust, and love for others to see. We are a family. We are a sign. A sign in our very bodies of what is to come. And what is that, you ask? LOVE, BLISS, COMMUNION... THE ONENESS. A unity in distinction, three persons in one family. Sound familiar? Whoa. I got schooled by the Holy Spirit, once again. "ZAH!" An examination of conscience kicked in.... What is the language of my body saying in that pew, in this place, in the grocery store, at the bank, the mall, the many places where we live and move and make our living? Eyes are seeing us.... this little family. Are we a sign of what is to come? We are called to be! Are we in love? The history of mankind, the history of salvation, passes by way of the family... The family is placed at the center of the great struggle between good and evil, between life and death, between love and all that is opposed to love. I've seen and heard (and been) the counter-sign often enough. Visit a department store at a peak hour or sale and you'll hear all manner of unlove, non-bliss, disunion and indifference in families. With bitterness, division, fracture, and a radical individualism, we can become rotted out building blocks for a culture not long for this world. How can any society stand on such tremulous ground? This is starting to sound as dark as that first reading from Ezekiel this morning... In this present darkness, the faithful family does seem to be exiled! Hmmm. Well, it's always darkest before the dawn, they say. And such darkness has a way of highlighting the light. Goodness, patience, charity, and basic human kindness have never shown so bright as now, when their absence can seem so mainstream. We have to pray that the morning star still rises in our hearts. And look for grace in the right place. We personally need to get our butts to Mass as often as possible. For into darkness we might go, but for the grace of God poured out on that altar, and deep into the heart of every child who believes. God help us! 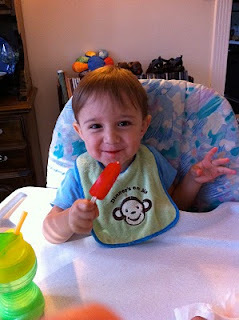 These are the final days before our little boy becomes a big brother. Another little life is coming our way! Another life that almost wasn't. Several months ago, a young woman entered a Planned Parenthood center intending to have an abortion, but someone, some word, some inspiration, got her to get out. So right now, somewhere a little unborn heart is still beating, and maybe the pace has quickened as this week that little life is due to enter into the light of day. This child is even now taking in those final nutrients, that viaticum for his or her departure from a life in the womb to the next life, here and now. Praise God! As for the Boy Wonder (adopted nearly two years ago! ), we're treasuring these final days with him as a solo artist. This week he makes the journey into "Big Brotherhood." We know things will change. The "appointed little king" as his name translates, will suddenly have a co-king, or queen! It's no longer just his universe in which to reign supreme. And we will have our hearts broken again at newborn beauty. 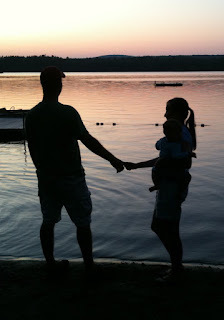 How can we love this third (remembering our Gracie in Heaven) as much as the first? Good words have come from family and friends to help us along. "Don't worry, you don't have to share the love like splitting it in half. The love just multiplies!" Amen to that! So we've sanitized everything again with anti-allergen spray, bought more Dreft laundry detergent, installed another car seat, and we're getting ready for less than 4 hours of steady sleep a night (we get 4.5 now if we're lucky). Last week was nearly a "grace overload" for the Donaghys. While we stayed at Normandy Farm Conference Center for the Theology of the Body Congress (which was incredibly inspiring) we had the pleasure of hosting the Missionaries of the Eucharist at our humble abode. 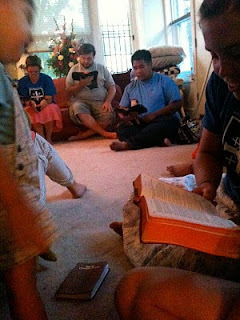 From the very first night (when all 12 of us stayed under one roof) these young missionaries filled our house with prayer. 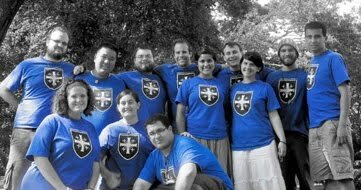 The MOEs, as they are affectionately called, are a traveling band of young people (some post college, some teenagers) who spend every summer "walking from Lewiston, Maine to Washington, DC to proclaim the beauty of the Catholic faith to everyone we meet, specifically through the Theology of the Body." They stay with host families, in church basements, school halls, anywhere they can rest their heads. And they'll talk to anyone; businessmen, families, kids, drug addicts, homeless men and women, the lonely and forgotten, and the young and materialistic. Everyone on the road for these young people is just another Jesus they haven't met yet. They sang Evening Prayer from the Church's Liturgy of the Hours, they goofed off with our little boy, they prayed grace reverently before we tore into those five delicious pizzas, they talked to us and to each other into the wee hours of the night on faith, and witness, sharing stories, and the power of God's love so needed in the modern world. I remember Erin speaking of the "beautiful people" that she and another of the walkers met that day in the city of Philadelphia. They sounded like they were the ones being given so much in this walk of faith. What a tremendous gift and a comfort to know this much wonder, patience, and hope is in the hearts of these young people; it enriched us and it keeps enriching everyone they stay with. They are truly walking the walk! For more info and to see if you can join them next summer for a part or all of the Walk, contact them here! My wife posted a beautiful series of simple, a cappella songs she composed and sang for our little ones, loved and lost through miscarriage over the past seven years. 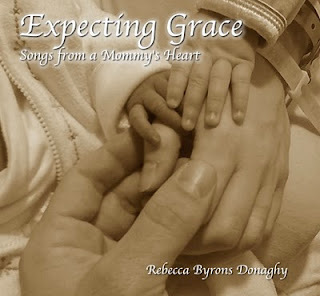 There are special hymns for Grace Elizabeth, our precious daughter who lived just 10 hours in this world, and for our little boy who is almost and unbelievably two years old. I hope you can consider supporting her music, again, composed in the midst of our first steps with infertility, through the hidden gifts of the Snowflakes adoption program, and into the "cross walk" of our days with our unborn Grace. She sings of the day Grace came, and returned to God, and she sings of the little Simon - our adopted baby boy - who came not a moment to soon to help us carry that cross. The link for the CD is here. We pray for any and everyone ever touched by the pain of infertility, the loss of a child, and for those discerning adoption. Our full story of Grace is here, and we always welcome thoughts, questions, and comments on these most intimate of faith/life issues.